Once upon a time in a land far far away there was a little village called Tihany, nestled on a hilltop high above the shores of Lake Balaton in Hungary, and in that village there lived a beautiful Princess. Many young suitors would come from far and wide to ask for her hand in marriage, only to be turned away with hearts broken, for the Princess was mute and could not speak to them. The Princess would spend her time tending her beloved herd of golden haired goats, grazing them in the hills around Tihany. One day the King of Waves came out of Lake Balaton and asked her for some of her goats’ magic milk for his dying son, promising in return to cure her muteness. The Princess obliged and seeing that his son immediately recovered the King gave the Princess the sweetest crystal sounding voice. Upon hearing her voice the Prince fell desperately in love with her but the Princess was proud and aloof and refused to speak to him. The Prince was devastated and inconsolable, finally died of a broken heart. The King of Waves was furious and cursed the Princess, locking her up in a rock while her beloved herd of golden haired goats were left to be devoured by the ravages of Lake Balaton. It is said that the Princess, trapped and alone in the rock for all eternity and desperate for companionship will respond to anyone who cares to address her, echoing their words back to them as they pass by. And so she has become the Echo of Tihany! While to this day the waves of Lake Balaton still wash up the hooves of her beloved golden goats upon its shores. In reality the echo, which has existed since the 18th century, but is said to be fading now due to the changing landscape, is believed to return to Echo Hill from the walls of Tihany Abbey, while the goats hooves washed up on the shores are pieces of prehistoric clams. 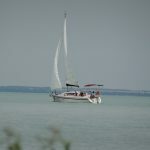 Nonetheless it is a charming legend very much in fitting with this beautiful little part of Lake Balaton. I have taken a slight deviation from the normal backpacker’s route and am in Tihany. It is a quaint little village and said to be the most romantic place in the region. Indeed as I stroll through the little streets filled with thatched roof cottages, traditional restaurants, confectionaries and craft shops I am truly enchanted. The summer temperature is soaring and as the sun beats down from the vast blue sky I occasionally catch the unmistakable waft of lavender fragrance. 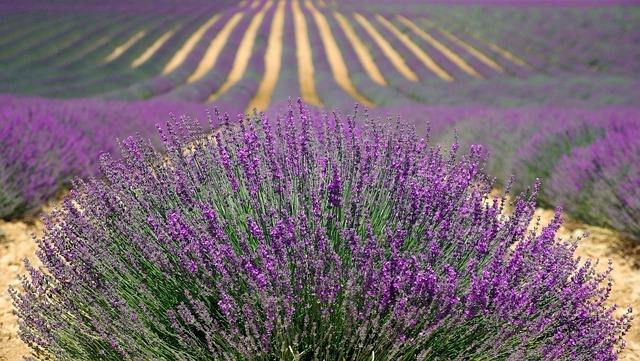 I have missed the Lavender Festival by a week and I can only imagine what a spectacular vision of deep purple the recently harvested lavender fields must have been. Nonetheless lavender is still everywhere. The craft shops sell every conceivable lavender creation from traditional lavender essence, pot pourri and soap to wreaths, pillows, strings, candles and much more. Crisp white lace table cloths delicately hand embroidered with lavender flowers hang outside shops, gently flapping in the breeze and hand painted pieces of pottery balance precariously on stone pillars and hang along fence fronts. Restaurant menu boards entice you with lavender infused dishes such as seared salmon or slow roast lamb washed down with lavender wine, water or beer. Cake shops boast lavender coffee cake, cheesecake and shortbread and bars promote inventive lavender cocktails. 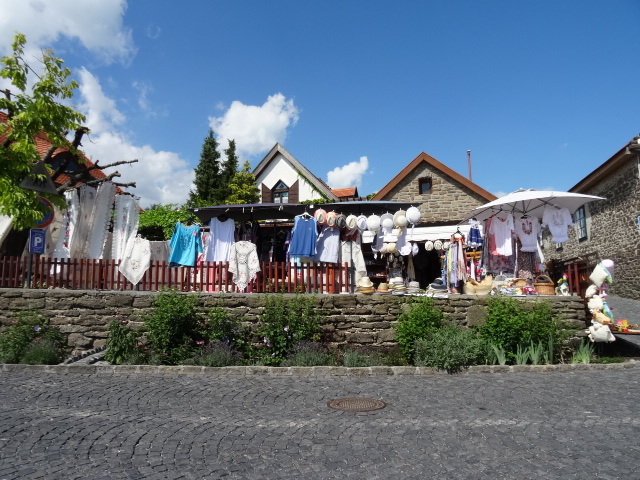 But it is the ice cream stands found on every street corner that dominates Tihany! Lavender ice cream, smooth and creamy and violet in colour is their signature flavour, but they have also taken the innovative ice cream flavour concept to the next level. Along with chilli or green tea, dark chocolate and lavender, Sicily pistachio and raspberry, they offer many extraordinary flavours such as bread, beer or gorgonzola ice cream! I constantly pass tourists scoffing delicious looking ice cream, expertly stopping it from melting down the side of its cone with their tongues, while the more adventurous tentatively dip their plastic spoons into little tubs of odd coloured culinary mysteries. However I am avoiding the ice cream. I have already indulged too much on this trip, ice cream being a European must have experience, and by now my slightly lactose intolerant digestive system is reminding me that enough is enough! I am listening to my body and I am strong! I am really strong!! But as I pass more ice cream stands with queues of tourists waiting with anticipation to be served and I wistfully watch others licking in self-indulgent pleasure, it occurs to me that perhaps I am the only tourist missing out, and so feeling excluded, I finally succumb! Soon I am happily slurping on a lavender ice cream, the sweetly perfumed flavour vaguely reminiscent of those little violet sweeties of my childhood, while I wash it down with a refreshing lavender lemonade! I am in heaven! It is an indulgent and delicious delight that understandably no tourist, not even I, could possibly resist!! 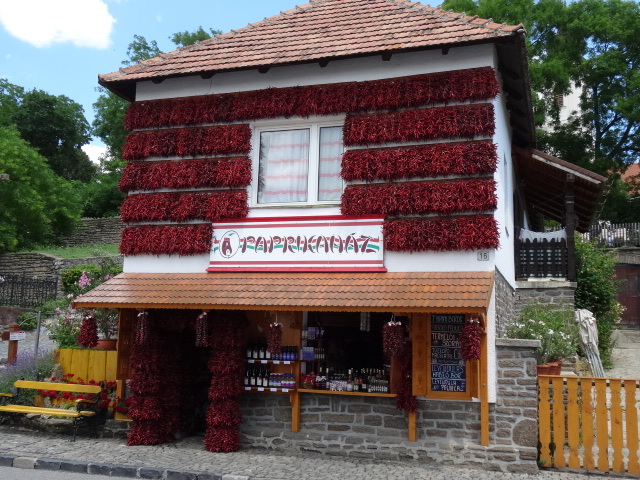 Later I pass by the Paprika House, its façade colourfully decorated with layer upon layer of dried paprika chilli peppers. 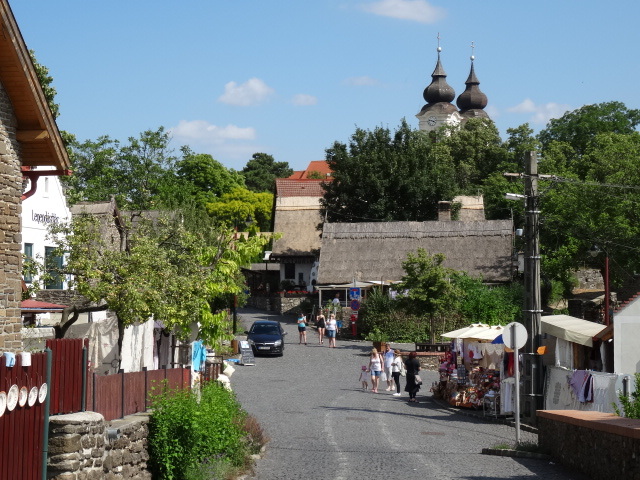 I make my way up the small hill to Tihany Benedictine Abbey. 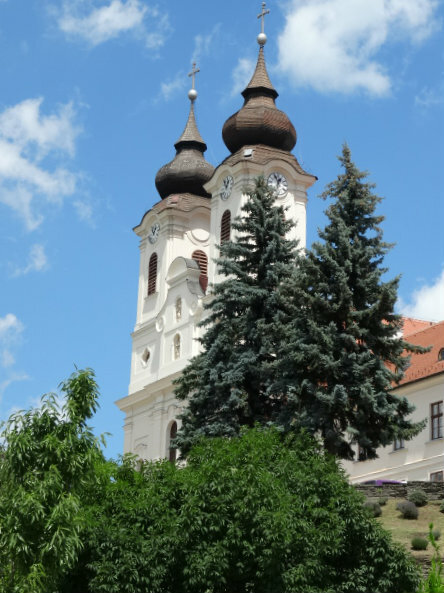 Its twin towers stand distinctly proud and tall at the highest point of the village and it is an important landmark, originally established in 1055 by King András 1, whose crypt still lies beneath the current church. The Abbey was rebuilt in the 18th century in Baroque style and now houses an interesting museum and exhibition of ancient times. 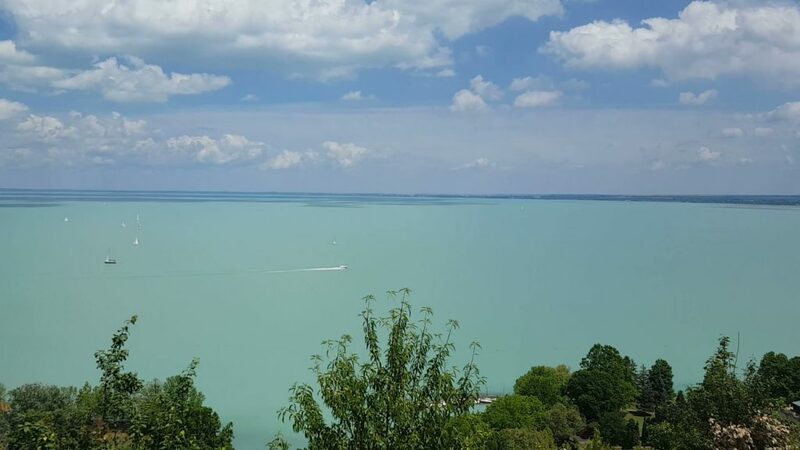 Next to the Abbey is the highest view point over Lake Balaton and my breath is simply taken away by the sheer beauty and expanse of this lake. It is overwhelmingly the scene of an Artists palette of blue, its milky turquoise colour changing in depth as it stretches out towards the horizon, its waters glistening against the contrasting blue sky filled with puffy cotton wool clouds, while ferries and sail boats navigate its calm surface. 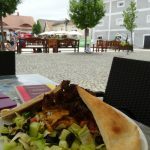 I am staying just outside the village and not far from Tihany’s Inner Lake, a much smaller lake, set in a tranquil country landscape surrounded by trees, green pastures and walking tracks. As I sit on the balcony of my Pension reflecting on my day, watching the sun set over this peaceful country village, I realise I have only just taken a glimpse of what there is to see and do here. 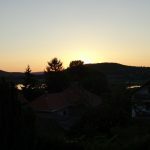 And as the sun finally sets over the village of Tihany with its legends and lavender, I am so glad that I have taken the time to visit this delightful little corner of Lake Balaton, even if it is just for a moment. For recommendations on where to stay and what to do in Tahiny visit Booking.com and TripAdvisor. Should you book or buy anything from these links or any others on this site I may gratefully receive a small commission at no extra cost to you, which helps towards supporting my blog. ← Why A Sling Bag Pack Is A Must Have Travel Companion! Greetings from Mo’orea in French Polynesia! I loved hearing about Tihany, lavender ice cream and a lonely princess! What a charming blog post 🌸! 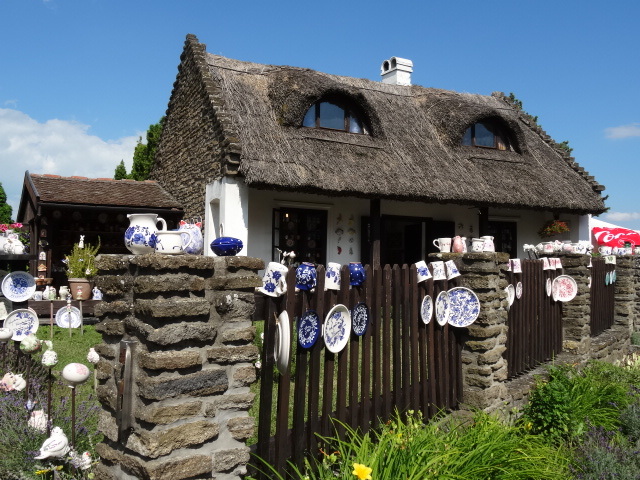 Thank you Sue, it was a lovely little place to visit and definitely a must see when visiting Lake Balaton. I love your photos of Mo’orea. It looks like paradise. Enjoy!